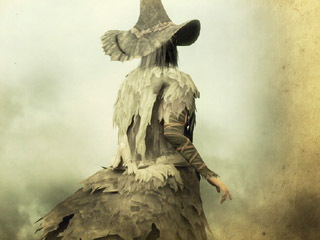 Yuria, the Witch is a NPC in Demon's Souls. Yuria practices a dark form of Soul Arts, to the great disapproval of Saint Urbain and his followers. She was imprisoned by Executioner Miralda under the watchful eye of one of King Allant's Fat Officials, but if rescued by the player, becomes one of the two advanced Magic teachers, along with Sage Freke, the Visionary. Dialogue from her and Biorr suggest that she has been subject to torture from the Fat Ministers. Inside the tower she is held captive there are two corpses holding the Ring of Magical Nature and the Ring of the Accursed. The item description of both these rings implies those corpses having been witches. Just like Stockpile Thomas' wife and daughter they have fallen victim to the Fat Ministers. (In Boletarian Palace you find two hung corpses, one holding the Jade Hair Ornament and the other the old ragged robes set. Due to Thomas' dialogue when you give him the ornament it becomes clear that these corpses very likely were his wife and daughter. Again the other corpse holding the same armor set as Yuria suggests that his wife was a witch and that was probably the main reason for their execution. Despite her use of dark Magic, Yuria is a kind, if timid woman, though she has demonstrated a remarkable temper, the quickest to become hostile out of all the NPCs. After the Slayer of Demons rescue Yuria she becomes infatuated with the protagonist, regardless of gender, going as far telling that she owes her life to the hero. Sage Freke, the Visionary once stated that Yuria's Magic is weaker than his because it stems from emotion, but no evidence exists that this is the case. Allows memorization of previously learned Spells. Unlike Sage Freke and his apprentice, she does not require 10 Magic and 10 Intelligence to memorize Spells. This side quest will require the player to have access to the Tower Knight Archstone. Obtain Iron ring of keys and Official's Cap by killing the two Fat Officials in Tower Knight Archstone. Backtrack to the end area of Phalanx Archstone just before the Tower Knight boss fog. In the room with stairs going up into the tower, there is a door which can be unlocked using the Iron ring of keys. This leads down to a dungeon below. Defeat the Fat Official down there to obtain the Bloody Key and open the cells to rescue Biorr. Go back to the beginning of Tower Knight Archstone, the Bloody Key will unlock the gate in the right alleyway behind the dog carts and fountain. Follow the alleys, and eventually the player will arrive at a tower, where on the top floor there is a raised staircase and a watching Fat Official above. Equip the Official's Cap as a disguise and the staircase will be lowered. Defeat the Fat Official (he will not be hostile until you attack him or remove the hat). Unequip the Official's Cap and speak to Yuria to finish the rescue. Note: You keep the Official's Cap in New Game+ but you have to find the Iron ring of keys and Bloody Key again. Note: Rescuing Biorr is not a necessary trigger for Bloody Key to work. Yuria can be rescued without ever opening Biorrs cell. Yuria turns hostile more quickly than other NPCs. When antagonized, she will always cast Firestorm first. From then on, she will attack with Flame Toss if the player is at a distance or Firestorm if the player is at mid-close range. Yuria will rarely pursue you away from her corner unless you step out of her sight range, yet remain nearby; she instead tries to bait you into approaching her so she can attack with Firestorm. Much like Freke, Yuria never runs out of MP. When turned hostile, she will cast Firestorm up to three times and use Flame Toss constantly for a while, then eventually stop casting. She will begin casting again after a short break, but at a much lower rate. Heavens, you… You… came to… save me? Thank you. No, I’m fine. With a little rest, I can soon walk. You go on ahead. I do not wish to be a dead weight. What do you want with me? Have you brutes no mercy? Do as you wish. There are no secrets here; only a tired, emaciated frame. Hello again. You saved me from great agony. I am sorry, for I cannot offer proper thanks. If you wish, however, I can teach you magic in trade for Demon souls. But my witchcraft is of a dark nature, and arouses suspicions. Why not try the magic of great Sage Freke? Once, I lusted after the power offered by Demon souls. I ventured through the fissure into Boletaria, but became trapped in the Nexus. Then, the King's executioner, Miralda, chained me up inside that tower. My thirst for Demon souls is no more. On the contrary, I find such power dangerous. Do you know Yurt, the silent chief? He dons pitch black armour, and a helmet with two sharp spikes. Yurts presence in Boletaria has resulted in the death of many a great hero. Whatever his motives may be, he is a grave danger to us all. Do watch out for him. I cannot bear to think of harm coming to you. Freke wields a different kind of magic from my witchcraft. while my witchcraft merely channels its energy. If the Demon is cursed, so shall be the witchcraft. Freke's power comes from human potential, while mine is a dark, dependent art. I feel great misgivings about Freke. I was branded a witch at a very young age, and since then, I have been persecuted as a threat to human society. Although I never had ill-intentions, this black craft of mine is intrinsically evil. If there is a God, he gave us souls to do good, not to practice witchcraft. My accusers detested my dark arts for good reason, for the path I have taken is tainted. This has been one of my realizations since coming to Boletaria. But I am afraid that Freke, too, has ventured down the wrong path. He has become obsessed with the dark arts. Are you certain you wish to learn witchcraft? Are you here for more Witchcraft? Very well. I shall help you however I can. If you are ever in need of Witchcraft, speak to me. It is a dark art, but it is all that I can offer. Thank you. Speak to me again whenever you are in need. Thank you. I hope that my witchcraft may be of some help. Though it is not known if it is an intentional reference or not, Yuria shares the name of Kenshiro's fianceé in Fist of the North Star.